Summer is here - well at least it feels like an outdoor sauna here in South Florida. In the midst of the hot temperatures and the scorching sun, Aldi sure has come to my family's rescue with their cheap and exceptionally crunchy Jumbo Aldi Waffle Cones. When my dad and his girlfriend were visiting for a couple of weeks, we were always looking for frugal treats, and Aldi sure did the trick. For the six of us, it would have cost a minimum of $4 per person = $24, if we were to get ice cream at the beach or at any of attractions we went to. 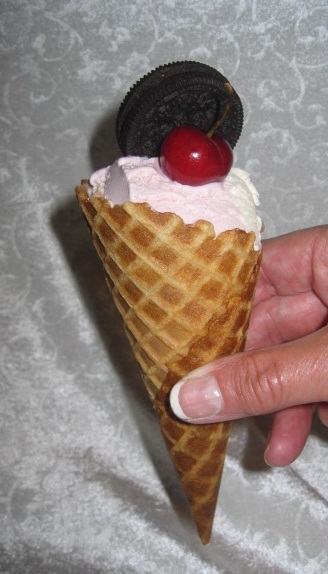 However, if we waited until we got home to make our own personalized ice cream cones from Aldi, we were in for a a much more frugal and tasty treat. Did you say ice cream? Aldi ice cream? This week there are great price cuts on some tasty Aldi ice cream treats, so don't miss out, stock up for the summer vacation. Are you hot yet? 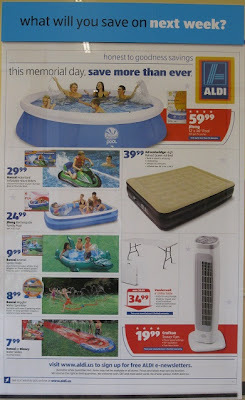 Here in South Florida it is hot hot hot, so the Aldi air conditioner sale is definitely coming at the right time. My kids are loving the Aldi sugar cones, and I am sure that the Benton Waffle Bowls will be a hit as well. We have tried several of the Aldi ice cream, and so far we have not had any complaints. 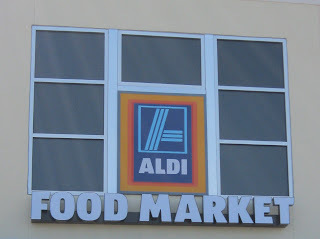 Here is the newest Aldi price list and grocery comparison list between Aldi, Target, Publix. Winn-Dixie & Walmart. If you have not tried Aldi's watermelon I can highly advise it....they are $2.99 at my store....and delicious. We are back to being five in the household again, and I almost felt like skipping Aldi shopping this week. However, my milk was going sour, and it is never fun to run out of fresh fruit or bread at my house. Did you see the $2.99 price tag for seedless watermelons at Aldi this week? We have had these water melons for the past three weeks and they are perfect. Don't cut them open as soon as you get home, leave it for a few days on the counter and it will be sweet and perfect. I also bought waffle cones again this week, as the once from last time was a big hit. I took photos, and I will have to get a review up. Everyone in my family highly recommend them. I found the following price cuts at my local Aldi store this week. These might vary from store to store, but it is worth keeping an eye out for similar price cuts at your Aldi Store. 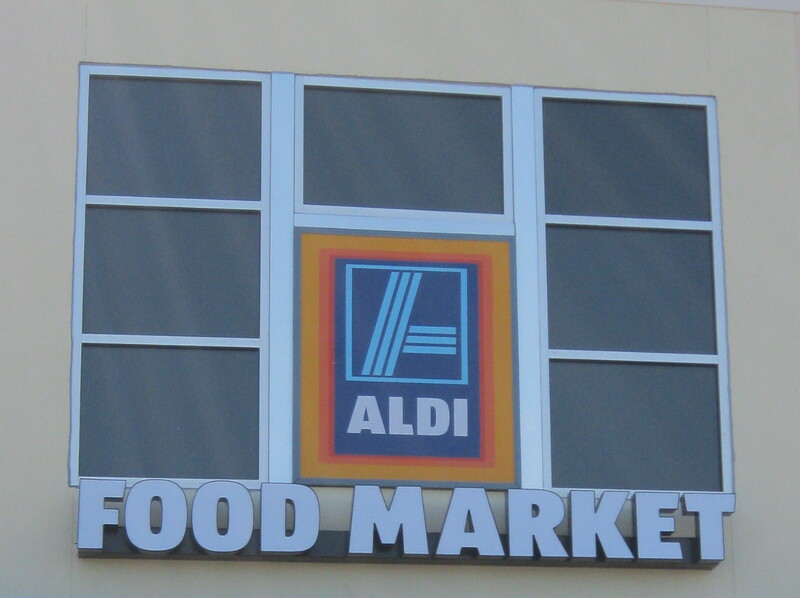 Have you found any price cuts at your local Aldi store this week? Our vacation guests has been exploring Florida for the past couple of days, so I am trying to catch up, before they return and we are off having a blast with them again. Today I made a quick trip to Aldi, and while we weren't missing much, I still ended up spending just as much as usual. I splurged and got Vanilla (which has been on my list for a while), sugar cones and ice cream for when our visitors return, and I even got myself an insulated bag. I have been wanting one of these for a while now, as the cooler bags usually only fit 1 or 2 items. After some very slim weeks at the Aldi New Low Prices section, it seems that Aldi is finally adding more products to the list. I am way behind on posting this week, and I probably will continue to be until next week. My dad is visiting from Europe, which means the kids and I are having a lot of fun, but our schedule is also upside down. Even though we have visitors, Wednesday morning is still all about Aldi, and I am excited to see tomatoes on sale this week. For the past two months, my cherry tomato plants have been providing plenty of tomatoes, but they are beginning to succumb to the extreme South Florida heat, and my once abundant daily harvest is no more. I still have more tomato plants, but they are not ready for harvest yet, and I wonder whether they can handle the heat. On a positive note, we have gotten the first ripe mangoes from our fabulous mango tree, and it looks like this year will be a good mango year. The mangoes are early, but so is everything else, as it has been a very hot spring in South Florida. This week you can definitely make a very frugal salad with the sale produce at Aldi. Come check out the new produce prices that Aldi in South Florida has this week. The outdoor sale continues at Aldi, and there are some great bbq products on sale this week. I made a quick stop at Aldi yesterday afternoon with two of my sons. We did not need much, but it was enough to make the trip worth it. I have been postposning the trip due to bad air quality from wild fires in the Everglades. Yesterday was actually the first day I went outside, but I guess the air quality was still bad, because I ended up with an asthma attack. Fortunately my boys do not seem to have been bothered by the smoke, but I have been keeping them inside as much as possible. I missed the new low prices update earlier this week, but I can see that a few new items has been added to the list. Wow, what a price decrease on Aldi cucumbers. In South Florida they went from $0.89 to $0.59 and this week they are on sale for $0.29. I will definitely be picking up a bunch. With Aldi's price increases Target has taken over the leading price spot in the bakery aisle this week both with eggs, flour, sugar, brown sugar, powder sugar etc. and even baking soda is now the same price at both places. Publix orange juice is actually cheaper than at Aldi this week, so I picked up three gallons. Aldi is still hard to beat on milk price, tortillas, cereals and produce. The savings on bananas is what pays for my bus ticket to Aldi each week...the rest is bonus. This has been a bit of a crazy week and I am way behind in my blogging work, so I apologize for getting the linky up late. My youngest son has suffered on and off from a stomach flu for about a month, and this week it just got crazy again. It got so bad that I had to take him to the doctor, and finally after getting some Florastor Kids (which btw is an over-the-counter medicine), his stomach seems to be getting better. I can highly recommend it. On top of that I am preparing for visitors, as my dad and his girlfriend will be arriving tonight from Europe. My middle son thinks my dad will get here tomorrow, so he is going to get quite a surprise when his grandfather will be there for breakfast. A recent consumer study from Market Force Information found that most Americans and Canadians find Aldi to be the #1 Affordable Price Leader when it comes to affordable groceries. This confirms what most Aldi lovers already knew: that Aldi does have the lowest pre-coupon prices. I am adding pre-coupon prices, because avid couponers are able to beat Aldi's prices on certain items such as toothpaste, diapers, condiments and more by combining coupons with sales at stores that accept coupons, which Aldi does not. The survey was conducted in March 2011 across the United States and Canada, and it had 6,100 participants. You can read the article and see the data from the Market Force Information grocery consumer study here. Thank you Paula for sharing this consumer study.